. إن الخدمات الممتازة وحسن الضيافة العالي في Hibiscus Motel تجعل إقامتك تجربة لا تنسى. يمكن الاستمتاع بمجموعة من الخدمات على أعلى المستويات في الفندق كمثل خدمة حجز التذاكر, مطبخ, تخزين الأمتعة, واي فاي في المناطق العامة, صف السيارات. لقد جهزت هذه الإقامة الفندقية بعناية فائقة لتوفر مستوى عالي من الراحة. في بعض الغرف يجد النزيل غرف لغير المدخنين, مكيف هواء, تدفئة, مكتب, اتصال لاسلكي بشبكة الإنترنت (تطبق الرسوم). كما أن مجموعة الخدمات الواسعة الموجودة في الفندق لضمان راحتك تترك لك الكثير من الخيارات لقضاء وقتك أثناء فترة إقامتك. استمتع بخدمات لا يعلى عليها وعنوان ذو اعتبار في Hibiscus Motel . Well located in the main strip. We were disappointed that the room wasn’t cleaned the entire 4 night stay as apparently they only do this if staying more. Our floors were dirty from the bad weather and wasn’t very pleasant. The outside area is unusable as it’s the car park. The beds were so soft (bad) and terrible pillows. The room itself had everything we needed and great big bath towels. Hibiscus is now run by Waves next door and we enjoyed our stay. It's on old motel with parking at the door, but inside is fully renovated to good standard and very clean. Location is literally 1 minute to town and beach so you can't beat it. Close enough to walk everywhere but just far enough from the centre to not get the noise. There's no pool or extra amenities so if you just want a clean room and bed close to everything this is the place. The staff was super friendly they even let us in earlier than check in time! Can recommend it and would go there anytime again! On arrival the motel looks nothing flash but when you enter the rooms they are very clean and very well appointed for the stay. The room was modern and has a kitchenette facilities, good bathroom, TV, tea and coffee facilities and a comfortable bed. Location wise it's perfect for exploring Byron Bay, a stones throw to the main areas of the town and the beach. Would definitely recommend and return. Nice and clean. And good location. When we parked up outside of the motel, the theme tune was Jaws but when we walked inside, we were pleasantly surprised. The rooms have been refurbished and they're fresh, incredibly clean. The pillows and the sheets were crisp and comfy. The location is phenomenal. This was all we needed for our visit, we were on a budget and it delivered. The only small gripe, was that the water pressure wasn't great, but it was adequate. We had room 10. Thoroughly recommend. great location with few blocks away from the main street and restaurants. clean and cozy room with all we need except the stove but it's a motel, so what would you expect. it's already fantastic to have a toaster and chopping board and lots of kitchen ware. oh, just though of one thing, if there could be a ventilation fan in the bathroom, it would be best. would stay here again if I ever come to Byron bay another time. When we arrived I thought we had made a big mistake. It was old style and very plain from the outside and you have to check in around the corner at the Waves Hotel. When we got the key we found that the unit was brand new inside and it was a very good motel room. It is in a good location to walk everywhere with the beach being a couple of hundred metres away. The motel was exactly as described and as per the online pictures. It was spotlessly clean and the rooms were recently renovated. The owner manager is very helpful and the location also very good. Awesome value for money. So clean I could give it 10 stars. Definitely a pleasant surprise considering it is only a 2 star accommodation. Location is close to everything. Lovely freshly renovated room - awesome location - easy to walk everywhere. Fantastic host who couldn't do enough for us ! Super nice and friendly staff, very flexible with checking in at night. Clean and central location. We were only missing free WiFi. Not a very fancy place but very clean with all the amenities you need. 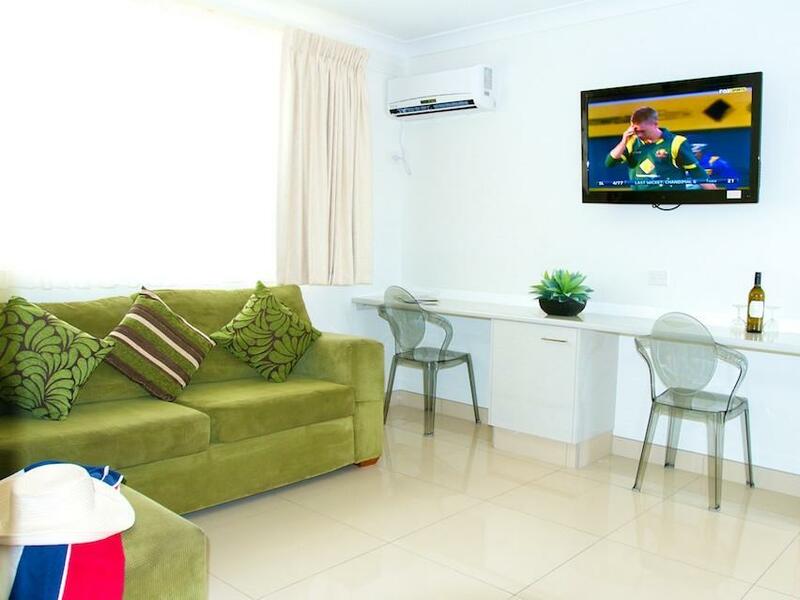 Easy walking distance to the centre of town but away from the Noise and parking in front of the unit is convenient. Great location, but very basic room consideration the room rate. The WiFi was only for a short period or 100mb, the TV did not have reception one night and generally was a little disappointing. Great location. Perfect in fact. Lovely staff and very clean and comfortable.